Today, on 28 September, the European Commission published its long-awaited Communication “Tackling Illegal Content Online”. This follows a leaked copy we previously analysed. The document puts virtually all its focus on internet companies monitoring online communications, in order to remove content that they decide might be illegal. It presents few safeguards for free speech, and little concern for dealing with content that is actually criminal. The Commission hastily removed references to domain name services having “a role to play in defining solutions” for illegal content, following the chaotic efforts last week by the Spanish government to shut down referendum websites in Catalonia using the domain name registry. This is a very good example of how the simplistic “solutions” proposed by the Commission run into trouble as soon as they are faced with real world situations. The Communication embarrassingly contradicts the Commission’s hugely controversial proposed Copyright Directive. Under the proposed Directive, all hosting services that optimise content in any way whatsoever are understood to be “active” and therefore presumed to be aware of illegal activities. Under the Communication on tackling illegal content online, internet providers are understood not to have knowledge of illegal content, even if they are actively searching for it. The Communication explicitly abandons Europe’s role in defending free speech internationally. In the final set of edits, it completely deleted a reference for the need to be consistent with, for example, the EU Human Rights Guidelines on Freedom of Expression Online and Offline. The Commission makes no effort at all to reflect on whether the content being deleted is actually illegal, nor if the impact is counterproductive. The speed and proportion of removals is praised simply due to the number of takedowns. However, in response to a Parliamentary Question about the takedowns that follow reports of serious crime sent from Europol to services providers, the European Commission said: “The EU IRU [Internet Referral Unit] does not keep any statistics of how many of the referrals to Member States led to the opening of an investigation.” The Commission points out that “removal of illegal content should not affect investigations”, but appears entirely indifferent as to whether it does or not. This is reinforced by the explanation that providers should cooperate with law enforcement authorities “where appropriate”. The European Commission puts huge faith in the use of “trusted flaggers”, which are organisations that are “trusted” to submit valid complaints about illegal content. These can then be assumed to be correct and the content can be removed more quickly. According to the Commission, “trusted flaggers can be expected to bring their expertise and work with high quality standards”. Indeed, the Commission is so trusting of “trusted flaggers” that it says that “balance needs to be struck between ensuring a high quality of notices coming from trusted flaggers” and “the burden in ensuring these quality standards”. For context, 99,95% of complaints made to Google under the Trusted Copyright Removal Programme referred to sites that were not even in Google’s index, let along illegal. Homer: Oh, Moe, how do I make ’em like me? to all the lazy slobs out there. Moe: Yeah. Now get out there and spread that message to the people. Moe: Whoa, hey. You didn’t pay for the beer. 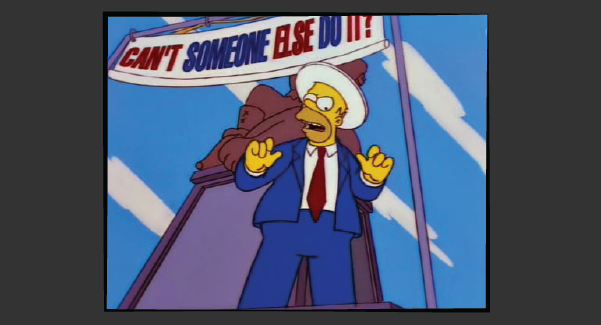 Homer: Can’t someone else do it?